Black Domina is a cannabis type of which the cannabis seeds are the absolute best in the area of indica-dominant varieties. Afghanistan at its best; that is the way to describe these weed seeds without exaggerating. Black Domina is a cannabis type of which the cannabis seeds are the absolute best in the area of indica-dominant varieties. Afghanistan at its best; that is the way to describe these weed seeds without exaggerating. Ideal for both the beginning growers and the more experienced growers so the result of the harvest is always great. Once the cannabis can be enjoyed, the smoker is usually sold for the rest of his life. Sensi Seeds introduces a crossing of Northern Lights, Hash Plant, Ortega and Afghani SA which is an excellent move. 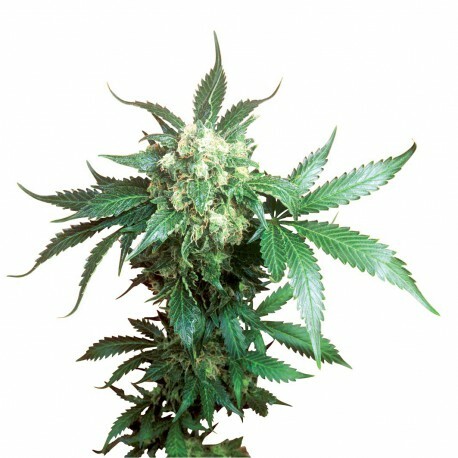 The indica-elements of this type are always clearly visible during growth and bloom and during the period of cultivating the Black Domina, the plant shows that it puts in the energy needed. Thick leaves, a long range and an amount of resin that seems to be almost impossible. The Black Domina flowers in approximately 50 days and the expert will not be surprised that these cannabis seeds have been welcomed worldwide with great acclaim. A cannabis cup at the Palmares was only a matter of time and meanwhile that award can indeed be credited to its name. Buying 95 percent indica cannabis seeds? Do not hesitate: Black Domina is available for you! Fall in love with this Domina and enjoy Afghanistan the way you have not met it before. This variety can be cultivated outdoor in a Mediterranean climate. When it is colder, the greenhouse or the house offers the right space to let these weed seeds completely come into their own.